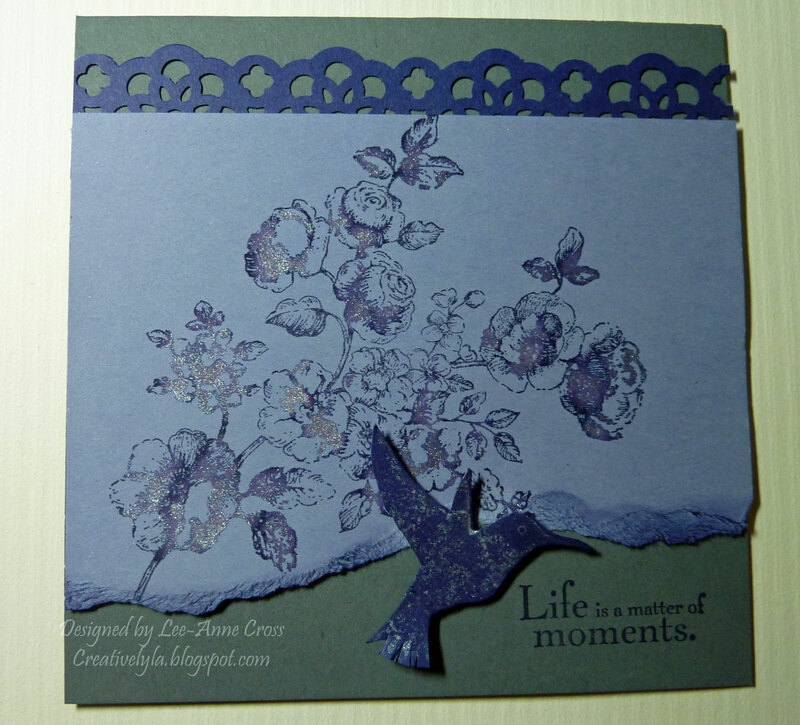 This card is in honor of our featured stamper over at Splitcoast today…stampercamper (Mary). Here’s Mary’s beautiful card that I chose to CASE. The cardbase is a 5″ square in Basic Gray. The punched border is a new punch from Stampin‘ Up! available July 1st. It’s called Lace Ribbon Border. Next comes the image layer of Wisteria Wonder that’s been stamped in Concord Crush and a watered down bit of Shimmer Paint in Frost White. The bottom of the image panel has been ripped and sponged with some Concord Crush, too. The little hummingbird is a scrap of Concord Crush that’s been stamped with more of the watered down Shimmer Paint. A simple sentiment treatment in Concord Crush and done! All images are from the Elements of Style set and all products are from Stampin‘ Up!